We hope this offers details on the timings typically offered in a catered chalet. No two chalets are run exactly the same, so this is a basic outline only, but the structure detailed below will give an idea of the daily plan of action! Your chalet host will arrive and begin preparing breakfast at around 7am. They will likely put the oven on first thing so there’s time to bake the cake for your afternoon tea – allowing time for it to cool before icing it. Your host will tidy up from the night before, lay the table and prepare breakfast. Breakfast will consist of tea, coffee and juice plus croissants, bread and condiments, cereals and yoghurt, and hot options such as bacon and eggs. Your host will have it all laid out on the table ready for you to enjoy when you wake up. As you’re skiing all day, you’ll need a big breakfast to fuel you for your day on the mountain. Your chalet host will make sure that you have enough food, and that tea and coffee is always topped up. 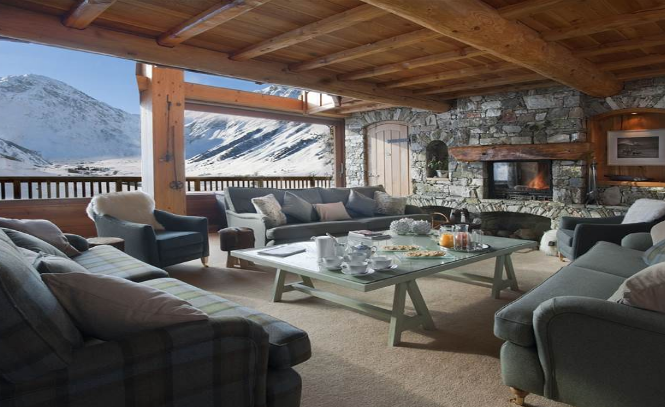 A beautiful catered chalet in the popular French ski resort of Val d’Isère. Once you’ve finished breakfast, it’s time for you to hit the snow. Your host will clear the table after you and clean your chalet. All the bedrooms will be done – beds made, pillows fluffed, surfaces wiped down and bathrooms cleaned. The host will also clean and tidy the communal areas. With the chalet now clean and tidy, your host will prepare afternoon tea and dinner ahead of your return later in the afternoon. The table will be set with the cake, fresh bread with condiments, and plenty of tea and coffee. Plates and cutlery will be left out so you can easily help yourself to the delicious spread. Your host will also prepare anything for dinner that can be done in the morning and left in the fridge during the day. Once your host is happy that the chalet is clean and tidy, afternoon tea is ready, and that everything is prepped and ready for dinner, then it’s time for them to leave the chalet and enjoy the slopes themselves. Working a ski season in the Alps is hard work, but the rewards are great! Your host will return to the chalet in the late afternoon to clear away your afternoon tea. If you have children in your group, then they will prepare and serve high tea around this time too. It is now time for the host to start the dinner preparations. They will set the table smartly and make sure that there is plenty of wine cooling in the fridge. Dinner is the main meal of the day in a catered chalet, and the perfect time to relax and unwind among friends and family. Once your host has prepared dinner, it’s time for canapés and aperitifs. This is the perfect time to gather together in your chalet, so you’re ready when dinner is served. The evening meal is the prime time to unwind in the chalet, so your host will give you the opportunity to relax and enjoy the meal. They’ll clear and tidy up after you, and you may decide to invite them to join you for a glass of wine afterwards. When dinner is finished and the chalet tidied up, your host will leave you with coffee and/or wine, and leave the chalet. They may head out to join their friends at the bar, or hit the hay ready to do it all again the next day. We hope this has offered a little insight into the catered chalet experience as a whole. If you’re looking to visit the Alps this winter and keen to try a delightful catered ski chalet, call us on 020 3080 0200 or get in touch via our online chat service. We’re always happy to help and advise.